Lateral or posterior consolidation (present in 90%) - Phrenic and PLAPS points. Note sliding is abolished when inflammation causes adherences - plural symphysis. This is common in pneumonia and ARDS. - B lines start laterally and progress anteriorly with increasing severity. - In symptomatic patients B-lines will be anterior, widespread and bilateral. - B-lines quickly disappear after treatment of pulmonary oedema. - Fluid descends to dependent areas. - The B-lines are therefore posterior, less widespread and more likely to be asymmetrical. - Lung sliding may be reduced or absent (as it is an inflammatory process the pleura can get stuck together). - Anterior subpleural consolidations may be present. - Spared areas of normal parenchyma may be present. - Pleural line abnormalities (irregular thickened fragmented pleural line) may be present. Normal anterior lung US is a very sensitive (though not specific) sign of PE. Peripheral infarcts can sometime be seen with US but these are neither sensitive or specific and are a feature of small rather than major emboli. The positive predictive value of DVT on US for PE was 89% but this increased to 94% when combined with normal anterior lung US. Common to have co-existing postero-lateral consolidation (about 50%) - Phrenic and PLAPS points. Those patients with normal lung US are more likely to have a conclusive test on V/Q scanning so reducing the need for CT irradiation. 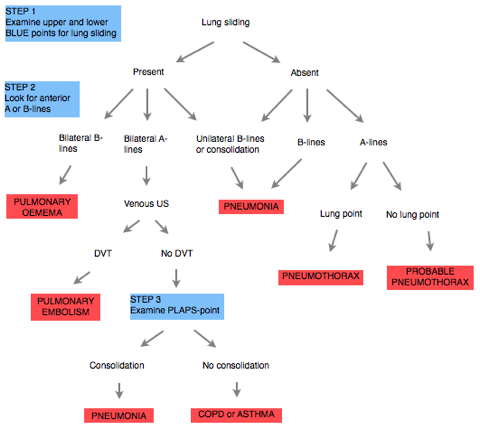 Indicate air so either normal lung surface (COPD, asthma, PE, posterior pneumonia)or pathological (pneumothorax). - No lung expansion - one lung intubation, pneumonectomy, v.low tidal volume, apnoea, atelectasis, bulla. Tissue and shred signs - alveolar consolidation (oedema, infection, blood) or atelectasis. Also commonly seen in PE. If anterior highly specific for pneumonia. If postero-lateral need anterior A-lines and sliding and absence of thrombosis to specify pneumonia. Anterior B-lines - interstitial oedema (haemodynamic and some pneumonias). A tool for acute respiratory failure which provides a 90.5% accuracy of diagnosis and takes only a few minutes. It should be done as part of the physical examination after the history and before other investigations. Check for anterior lung sliding at these points. If present this rules out pneumothorax - continue to step 2. If absent - continue to step 2. Look for anterior A or B-lines. If bilateral the diagnosis is pulmonary oedema. If unilateral the diagnosis is pneumonia. Look for the lung point. If present the diagnosis is pneumothorax. If absent the diagnosis is probably pneumothorax. Consider alternative imaging. If DVT present the diagnosis is PE. If DVT absent continue to step 3. Bilateral B-lines mean pulmonary oedema. Bilateral A-lines are normal and means you need to perform venous US. A-lines mean pneumothorax likely and should prompt a search for the lung point. If this is not found then alternative imaging should be considered. A normal PLAPS will show sliding and A-lines. An abnormal PLAPS means consolidation and/or an effusion. If consolidation is present the diagnosis is pneumonia. If absent the diagnosis is COPD or asthma. How good is the BLUE protocol? The 90.5% diagnostic accuracy was obtained just by looking at the ultrasound images. Combination of these with history, physical examination and other investigations will improve this to closer to 100%. For example, the combination of the BLUE protocol with echocardiography would have detected the 7% of patients with pneumonia who had bilateral B-lines mimicking haemodynamic pulmonary oedema. Specificity for each disease 94% or greater. Sensitivity for each disease 89% or greater (except for PE - 81%). 62 of 64 had bilateral anterior B-lines. In this condition fluid fills the interlobular septa against gravity so B-lines are anterior, bilateral and widespread. There is no intermediate features between an A and B pattern. There is obviously a threshold reached where A lines suddenly change to B lines. B-lines will increase in number and have a smaller distance between them as oedema worsens 7mm - 3mm. Alveolar consolidation was common in these patients at the PLAPS point (88%), as would be expected due to the dependent nature of severe oedema filling the alveoli, but it is unnecessary to look for this for the diagnosis. 62 of 64 patients had anterior B-lines. PE - 20 of 21 had normal anterior US. 81% had DVT visible. 1 patient had anterior consolidation and 50% had postero-lateral consolidation. Co-existing infection was common. This illustrates why you should follow the protocol - if you just looked posterolaterally you would make the diagnosis of pneumonia incorrectly. Most SCANS were normal as would be expected in conditions that affect the bronchi. 7 of 49 of COPD had an abnormal US which would be accounted for by coexistant infection or a real diagnosis of pulmonary oedema. All had abolished lung sliding and A-lines. 8 of 9 had a visible lung points. What about other lung diseases? Note that the BLUE protocol does not include pleural effusion or chronic interstitial disease / fibrosis as a diagnosis. This is because they are rare causes of acute respiratory failure. They are easily detected by methods outside of the protocol. Combination of the BLUE protocol with history, examination and other investigations (eg bloods) will improve accuracy to closer to 100%. The protocol was designed to assess acute respiratory failure in spontaneously breathing patients. The BLUE protocol will have some limitations in ICU patients. Virtually all ventilated patients will have a positive PLAPS (atelectasis, effusion). So, a post-operative patient with atelectasis would be classified as having pneumonia by the BLUE protocol. But it is still very useful. Already shown by Lichtenstein et al in 2004 that in ARDS patients lung US has a higher diagnostic accuracy than CXR for effusion, consolidation and interstitial syndrome. Lichenstein et al (2004) Comparative diagnostic performances of auscultation, chest radiography, and lung ultrasonography in acute respiratory distress syndrome. Anaesthesiology 100:9-15. A recent study published in 2011 in ICM looked at a general population of medical and surgical ICU patients. Lung US in critically ill patients: comparison with bedside chest radiography. Xirouchaki et al. Intensive Care Med (2011) 37:1488-1493. Lung US and CXR were compared to CT as the gold standard. 42 patients prospectively studied (84 lungs). Lungs were divided into 12 regions as described by Lichtenstein in 2004. The study showed that BLUE protocol is right in looking at fewer areas - region analysis confirmed that diagnostic accuracy would have been just as good if just the anterior BLUE and PLAPS points were examined (discrepancies with CT were in adjacent regions eg lower lateral and lower posterior). In fact the reason the authors examined more areas was because that was what Lichtenstein advocated in earlier publications before he had simplified his approach based on years of data. Fluid is forced upwards by hydrostatic pressure. B-lines will therefore be anterior, widespread and bilateral. Lung sliding may be reduced or absent (inflammation causes exudative fluid which sticks the pleura together). Loss of aerated lung (B-lines, consolidation, atelectasis) suggests weaning will be more difficult. A recent study presented at the ESICM annual conference showed that assessment of lung aeration by ultrasound prior to, and at the end of, a spontaneous breathing trial both successfully predicted extubation distress. Ultrasound assessment of lung aeration loss during a successful weaning trial predicts postextubation distress. Soumer et al. Thanks to Tom Clark for sending me the abstract. In patients with cardiogenic pulmonary oedema, semi-quantification of disease severity may be obtained by evaluating the number of B-lines as this is directly proportional to the severity of congestion. In patients with cardiogenic pulmonary oedema, B-lines should be evaluated because it allows monitoring of response to therapy.